Let’s reimagine the future of vaccine innovation by focusing on demand side actors. Are new or in early stages but are related to the core competencies of your organization. Shortlisted concepts will receive feedback from the Gates Foundation and additional expert stakeholders in the vaccine innovation space. Up to $50K in prize funds will be available for up to 10 Top Ideas. Additionally, selected Top Ideas will be invited to meet with and pitch to the Gates Foundation Vaccine Innovation team. Read the full Brief and submit to the Challenge. We've extended our submission deadline to Sunday March 17th at 5pm PST! Check out our Challenge resources, curated to support your participation. Learn more about the Gates Vaccine Innovation team and practice. Alongside the Bill and Melinda Gates Foundation, this program challenges our global community of designers to come together and build solutions to address the following question: How might we empower caregivers to seek and fully utilize immunization services in their communities? Together, we’ll explore the current state of vaccine innovation in global public health, why caregivers play such an important role in the system, and which lenses might help us to most effectively understand and design for solutions. Share your ideas to answer the Challenge question for a chance at a share of $50K and an opportunity to pitch in person to the Gates team, due by March 17, 2019 at 5 p.m. PT. Stay tuned for our webinar announcement calendar. Starts on Feb 11, 2019. Ends on March 17, 2019. All eligible submitted proposals are reviewed. Share your feedback on submitted proposals. Shortlisted candidates will be announced on Tuesday April 9, 2019. During the Refinement Phase, up to 50 shortlisted concepts are invited to develop prototypes, plans to scale their business model, and other demonstrations of the solution’s ability to satisfy the goals of the Challenge. All teams participating in Refinement will have acess to expert feedback, support from our community fellows, and peer to peer knowledge building. Refinement will consist of 3 components: Beneficiary Feedback, Expert Feedback, and Improve. Shortlisted teams improve their ideas through beneficiary and expert feedback, and community support. Refinement materials are due by May 7, 2019 at 5:00 p.m. PST. Top Ideas will be announced in June 2019. Stay tuned for the announcement of Top Ideas. Immunization saves an estimated 2-3 million lives every year. Whether preventing poverty, saving lives or eliminating other public health challenges, vaccines allow people around the world to lead full and healthy lives. Vaccines are also good for development—for every $1 spent on childhood immunization, $44 is returned in economic and social benefits. They protect against malnutrition and disease, expand gains in education and socio-economic growth, and provide a point of contact for health care in the critical early childhood years. Simply put, immunization can be called one of public health’s most cost-effective interventions in the 20th century. In 2017, the number of children immunized—116.2 million—was the highest ever reported. Since 2010, 113 countries have introduced new vaccines, and more than 20 million additional children have been vaccinated. Unfortunately, the successes in immunization uptake worldwide do not outweigh the continued challenges. Globally, 1 in 10 children still does not receive all their vaccines—mostly in the world’s poorest, most disadvantaged communities. Since 2014, the number of countries reporting vaccine hesitancy has steadily increased, reaching 83% in 2017. Barriers include issues such as mass urbanization and migration, political conflict, natural disasters and environmental disruption, to name a few. Now more than ever, it is crucial that our global community works together to support the adherence of vaccine immunizations within those communities and regions that are still falling short in access and equity. In this program, we will focus on demand side actors—specifically caregivers or those who are the primary adult responsible for caring for a child on a day-to-day basis—to design human-centered solutions that address the problem at present. Why Demand Side, and Why Caregivers? In the world of vaccine delivery, actors are often split into supply (how vaccines reach the people to whom they will be administered) and demand (products, services, and experiences focused on caregivers and communities receiving vaccines). Demand generation is an important aspect of immunization programs. It ensures that caregivers, communities and other key stakeholders value immunization, find it a safe and effective practice, feel confident in the reliability of services and provision systems, and are aware and motivated enough to seek immunization services. There are many different actors that influence demand within the vaccine innovation ecosystem—community, family, healthcare facilities, national health systems and policy actors, producers, distributors, and so on. Moreover, ‘demand generation’ is both a relatively new and difficult area for many countries to be investing in systematically—and as a design challenge, still remains quite broad. For this reason, this Challenge is specifically focused on caregivers as a window into immunization. We define a caregiver as the primary adult responsible for caring for a child on a day-to-day basis (and therefore the person who would most likely accompany / bring that child to an immunization session). In most cases this is probably the mother, although could be a father, grandmother/father, uncle, aunt, or other responsible person, depending on the culture and family situation. Why is this our priority focus? Framing around the caregiver shifts our mindset toward “customer”-centric thinking (within a space that has largely been oriented toward suppliers and delivery approaches), and allows us to explore the nuances of demand through a human lens—understanding the current immunization experience and why so many new solutions are needed. Supporting caregiver needs is not a one-size-fits-all solution. Their demands are influenced by experiences before, during, and after the vaccine immunization journey. Psychologically, caregivers move through multiple internal stages before arriving at immunization as well—awareness, acceptance, intention to vaccinate and (ultimately) seeking informed care. They drop off or are unable to adhere for a variety of reasons, from a lack of education or awareness, to physical environmental barriers, to perceived misconceptions around cost or ease of access. There are many moments in the journey for which we can design for better uptake and adherence. Read more about our Opportunity Areas below to understand the different perspectives from which we hope participants will design for this specific issue. Opportunity Areas are specific calls to action that guide our community during the Ideas Phase. They serve as provocations that are intentionally aligned with our Challenge topic and partner priorities, while ripe for innovation. Regardless of the Opportunity Areas chosen, the hope is that all ideas will approach the Challenge question through the lens of accessibility. This will encourage us to learn from outliers, and be critical about the ways in which our solutions can be applied to various populations and different persona communities. Paying attention to users outside the mainstream will help us uncover hidden insights and work-around solutions that will strengthen the broader vaccine innovation system as a whole. High quality service delivery is vital to ensure that parents and caregivers have a positive experience at the health facility, and are motivated and able to return. Ideas in this category may touch on interpersonal communication, motivation, and community planning. Evidence-based social and behavioral change activities focus on improving community awareness and knowledge, creating and continually reinforcing positive social norms towards immunization, as well as providing individualized reminders on where/when to go for services and timely motivational ‘nudges.' This helps to bridge the ‘intention to action’ gap. Ideas in this category may touch on norm setting, behavior nudging, and social/behavioral adjustments via technology or community programming. Sustaining public trust and confidence in immunization is a key objective of national immunization programs, but certain events can erode confidence in vaccines, and in the systems delivering them. Ideas in this category may touch on encouraging healthy strengthening of risk capacity, social listening to build resilience, and leveraging media engagement for transparency. Immunization programs benefit from building social and political will from the grassroots level up. Ideas in this category may touch on leveraging cross-sector influencers, supporting and connecting Civil Society Organizations, and ultimately enabling policy. Strategic and effective use of quantitative and qualitative data is vital for the success of demand generation efforts and provides a strong foundation for monitoring, learning, making adjustments, and communicating the success of interventions. Ideas in this category may rely on data systems and tools to appropriately understand the real-time status of caregiver experiences and inform further development of innovations. Submissions are welcome from registered nonprofit, civil society, community-based, and for-profit organizations working anywhere in the world. Individuals or teams without affiliation with a registered organization are welcome to submit, in partnership with a more formal entity. If you would like help with this aspect, please submit a draft early in the process and indicate this need in the comments section of your submission. All participants should be serious about their commitment to further their innovation and implementation after the close of the Challenge, and intend to translate or scale their innovation for impact, especially with consideration for current or eventual implementation within the East African context. Clearly articulating an answer to the Challenge question. Addressing a problem that is pressing and real by articulating the gap this idea is filling. New or in early stages of development, but related to the core competencies of your organization or group. Submitted by organizations or groups that have worked in their sector for at least one year. Implemented in low resource settings. While the Gates Foundation and Challenge team are interested in innovations implementing in (or translatable to) the East African region, we are considering applicants from all geographical regions. Have a clear hypothesis underlying the proposed approach to improve immunization programs and/or improve the user experience of beneficiaries. Involve building on, disrupting, or adapting existing systems. Successful proposals will describe how their approach would work within existing health systems or what change would need to occur within health systems for their approach to be effective. Take a new approach to a problem, or use an existing approach in a new way. Have improved in response to feedback during the Challenge. Demonstrate a deep understanding of the context of proposed solution. Be considered desirable by experts in the sector and end users. Does not increase burden upon frontline health workers. Minimizes perverse incentives (including incentives for falsification). Is relevant in multiple developing country settings. Constitutes transformative rather than incremental improvements, and is deliverable and scalable in low-income countries. Approaches not directly relevant to low-income settings. Approaches reliant upon financial incentives. Solutions focused on SMS reminders. Approaches that rely on traditional information, education, communication approaches. If you have questions around the submission process, or the Challenge in general, you can contact GatesVaccineInnovation@IDEO.com for more information. Please review this list of Additional Resources to help you get started. 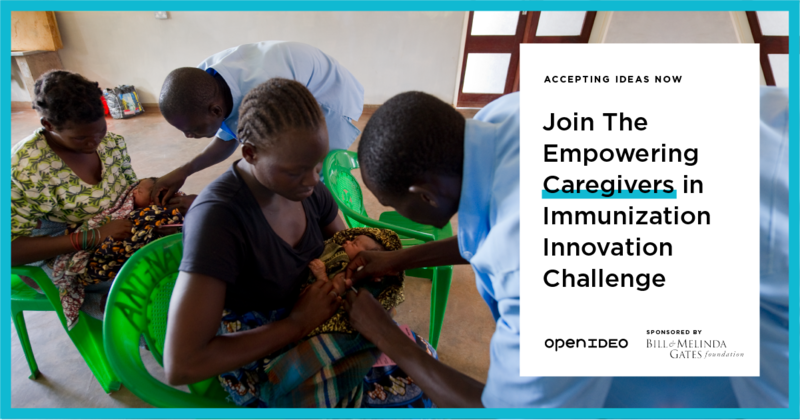 We’re thrilled to create an ecosystem of collaboration and feedback for all participants submitting to the Empowering Caregivers in Immunization Challenge. Shortlisted concepts will receive feedback from the Gates Foundation and additional expert stakeholders in the vaccine innovation space. Up to $50K in prize funds will be available for up to 10 Top Ideas. Additionally, selected Top Ideas will be invited to meet with and pitch to the Gates Foundation Vaccine Innovation team. Prizes shall be awarded solely based on Challenge recipients’ past accomplishments and achievements in developing their ideas, with no requirement to take further action or perform services. Launched in 2000, the Bill & Melinda Gates Foundation is a private foundation founded by Bill and Melinda Gates. At the Bill & Melinda Gates Foundation, all investments in vaccines and immunization contribute to the goals of the Decade of Vaccines. As one entity within the greater vaccine community—which includes national governments, other donors, international organizations, the private sector, academia, civil society organizations, faith-based organizations, and local communities—they are working to ensure that existing life-saving vaccines are introduced into countries where people need them most and to support the innovation needed to develop new vaccines and new delivery technologies and approaches.